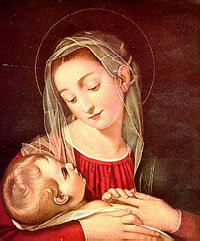 Today the Church celebrates the Solemnity of Mary, Mother of God, our Lady's greatest title. This feast is the octave of Christmas. In the modern Roman Calendar only Christmas and Easter enjoy the privilege of an octave. According to the 1962 Missal of St. John XXIII the Extraordinary Form of the Roman Rite, today is the Solemnity of Circumcision of Our Lord. A plenary indulgence may be gained by reciting or singing the hymn Veni Creator Spiritus on the first day of the year. This hymn is traditionally sung for beginnings of things, calling on the Holy Spirit before endeavoring something new. Although New Year's Day is not celebrated by the Church, this day has been observed as a holy day of obligation since early times due to the Solemnity of Mary, Mother of God. Each family and country has different traditional foods to eat on New Year's Day, with lentils being the main superstition: ill luck befalling those who do not eat lentils at the beginning of the year. New Year's is a day of traditional hospitality, visiting and good cheer, mostly with a secular view, but there is no reason that this day, too, could not be sanctified in Christ.